The 2018 Night of Stars Breeding Gilt Sale was a standing only room affair at the Oklahoma Youth Expo on Wednesday evening- and there were people watching in from all across the country with the ability to big online for the first time ever for the annual sale of the top female hogs shown at the world's largest junior livestock show. Blake Kennedy, who operates the annual Perfect Time Pig Sale each November, was involved with helping take the Night of Stars Sale online- increasing the potential number of buyers by bringing the sale to anyone across the United States that wanted to tune in, sign up and bid. Kennedy talked with Radio Oklahoma Ag Network Farm Farm Director Ron Hays just ahead of the sale- and his comments are a part of the overview of the sale that you can hear by clicking on the LISTEN BAR below. 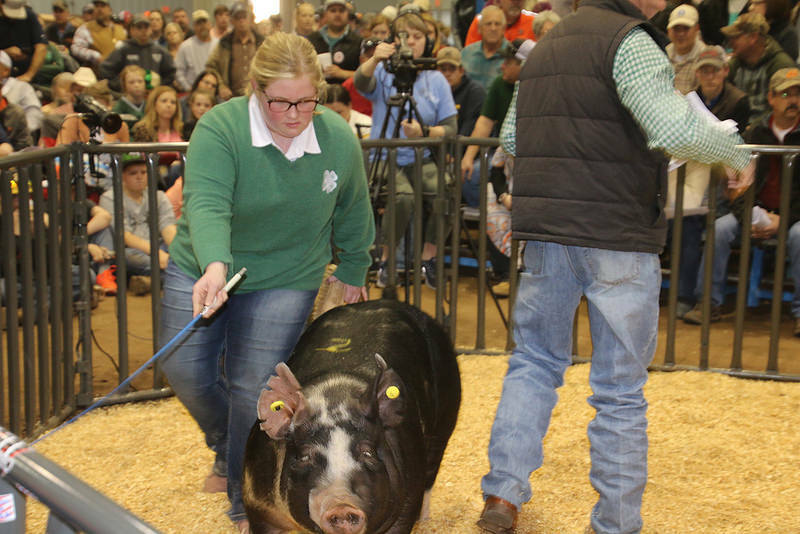 Rachel Rumsey of Prague FFA also had a great Night of Stars sale- as she had a pair of crossbred Commercial gilts that were bred by Hofschulte Genetics- and ended up bringing $16,000 and $20,000 respectively. The Champion Spot gilt, owned by Grace Montgomery of Red Oak FFA, commanded a final sale bid of $17,000 while the gilt that led off the sale, the Supreme Champion Purebred Gilt- a Yorkshire owned by Adison Thompson of Noble 4-H, brought $11,000.